Health Mark's Smart Chair is the ultimate chair for healthy posture. Featuring an adjustable and moveable back support, the Smart Chair has a special design that cradles the spine in comfort. Four height settings provide a perfect fit, and a curved cross bar underneath holds the ball firmly, offering extra stability. The 55cm/900g TUV tested anti-burst ball accommodates weight up to 300 pounds. 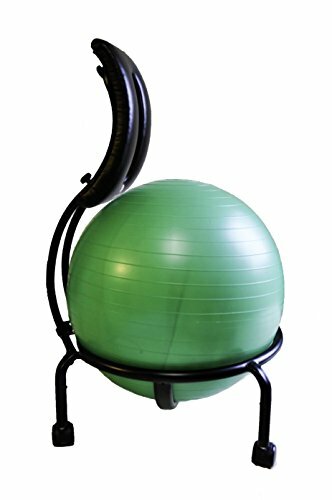 Take a break from your desk duties and use the Smart Chair for balance ball exercises, including back extensions, core and upper body training. The Smart Chair by Health Mark is a must-have for any office or workspace. Health Mark -- creating high-end exercise and therapy equipment for over 18 years and counting!